NEW VIDEO: Why must America stand strong against ObamaCare? In this new video from The Heritage Foundation, the four authors discuss the most sweeping single piece of social policy legislation in the nation’s history, and the very real and legitimate fears of a government take-over of our health sector that have caused millions of people to take to the streets in protest. Rep. Tom Price, MD, and Sen. John Barrasso joined us yesterday for our Capitol Hill book launch, hosted by AEI. 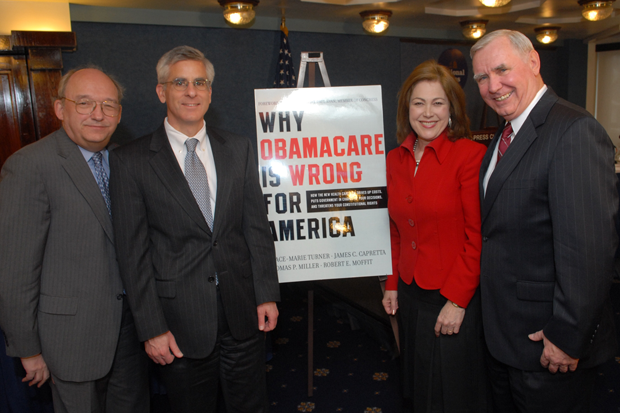 All four co-authors spoke to a full room of Congressional aides about Why ObamaCare Is Wrong for America. Rep. Price said “this book is so incredibly important” and described how useful a tool it is to anyone trying to learn what was in the health legislation that passed a year ago. Watch the video below to hear Rep. Price’s remarks and the great presentations by our panel of co-authors. Christopher Georgia of the American Action Forum interviewed co-author Grace-Marie Turner about Why ObamaCare Is Wrong for America, court challenges to the health overhaul, and other health reform issues in a series of short videos. Visit the American Action Forum YouTube channel to see all four videos in this series. Freedom Watch: Free Health Care! Co-author Grace-Marie Turner joined host Judge Andrew Napolitano for his Freedom Watch program this week, which will be broadcast this Saturday at 4pm on the FOX Business channel. They discussed Why ObamaCare Is Wrong for America and free-market alternatives to health reform. Varney & Co: Health-Care Law Turns 1, Will it Make it to 2? Co-author Grace-Marie Turner was interviewed yesterday by FOX News Correspondent Jim Angle about the impact of ObamaCare so far. Watch the clip and share your thoughts with us in the comments below.